I know, I know.... I'm a little crazy. I did have a back up plan for another attempt at chocolate mint brownies, but because I had some leftover almond meal from making a cake, and this recipe is small batch, I went for it. It was a cold and rainy Saturday afternoon after all, a perfect day for hanging out in the kitchen. I am both terrified and in love with making macarons. I've had my share of failures, but there is nothing like staring into the oven through the window and seeing those gorgeous "feet" forming. It's pretty much happy dance time. P.S. 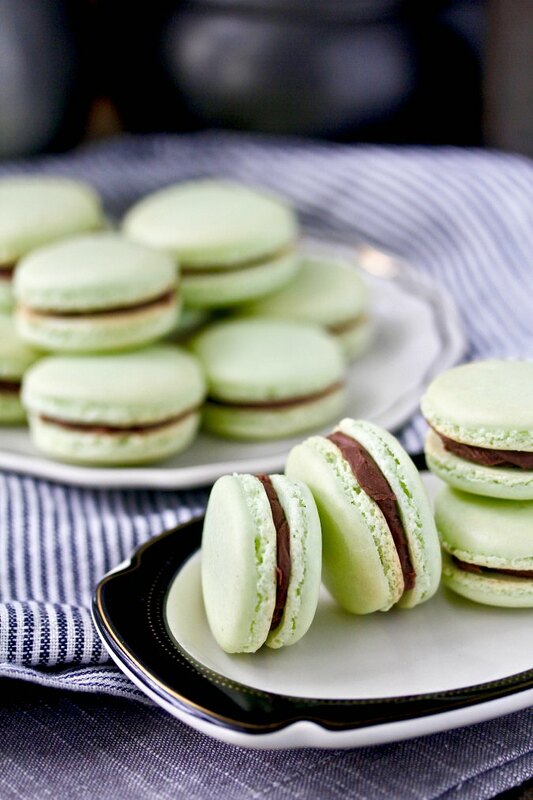 If you're a macaron newbie, the "feet" are the crinkly edges that form while baking. This recipe makes just about 18 to 24 sandwich cookies, so you don't have to use a lot of expensive almond meal in case things don't work out. In addition, the egg white mixture includes meringue powder, which seems to make these much less fragile. Use a kitchen scale. It's essential to weigh your ingredients for macarons. I love this scale. Be sure to use good quality parchment paper or a silicone baking mat. Thin parchment will stick to the shells. Hold the shells by the edges when you are filling them, lest you poke a hole on the top of the shells. Of course, if you do poke a hole, just eat the evidence. You don't have to be too gentle when mixing the almond and sugar mixture into the egg whites. In fact, you want the mixture to be kind of "flowy" without too much air. Still, you can over mix. It's a fine line. I have a set of boldly drawn circles photocopied paper on 8 1/2 x 11 inch pieces of paper that I stick under the parchment paper before piping to help make even rounds. If you see bubbles forming on the resting shells before baking, poke them and smooth them over with a toothpick. Age the egg whites. I actually separated the eggs one week before making these and refrigerated them, covered. Be sure to let your piped macarons sit for 30 to 45 minutes, depending on the weather, so that the tops form a skin. This helps ensure that you will get "feet." I've learned all of these tips through trial and error, and I'm still learning! 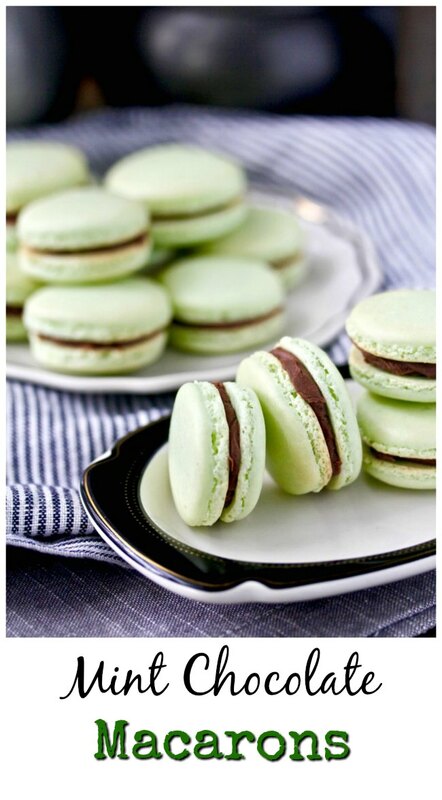 The macaron shells are made from almond flour, sugar, and egg whites, and are mildly sweet. They typically get their flavor from the filling (although I did make an Ovaltine flavored shell once.... I need to make these again!). 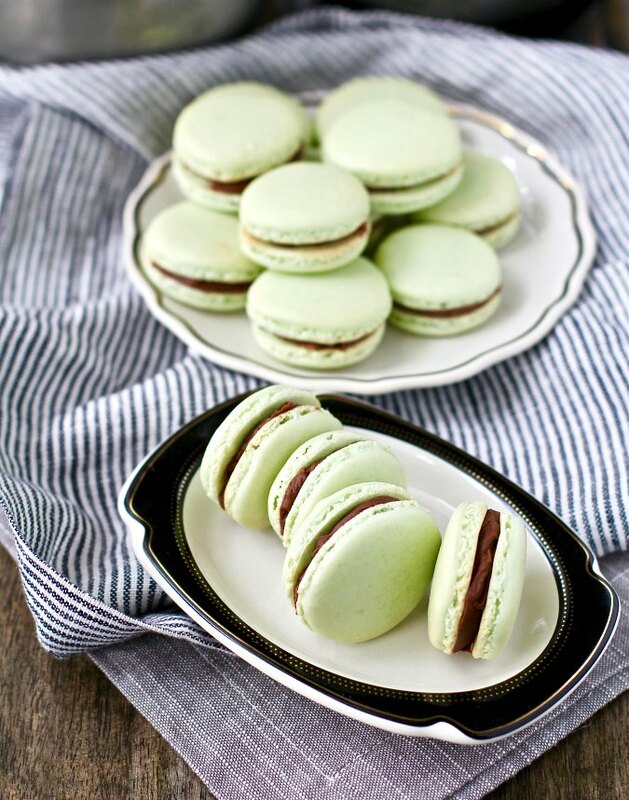 In fact, French macarons are at their peak after about 24 hours in the refrigerator. This gives them time to soften on the inside and absorb the filling flavors. They'll still be crispy on the outside. To color the shells, I added some powdered food coloring to the almond and powdered sugar mixture. If you have gel food coloring, add it during the "macaronage" process, the mixing of the almond meal mixture into the egg whites. Check out these bright pink macarons colored with just a couple of pinches of powdered food coloring. In the bowl of a food processor, pulse the almond flour, powdered sugar, and powdered food coloring a few times until blended. Sift the almond and sugar mixture through a mesh sieve, discarding any larger pieces. In a medium bowl with a hand mixer, beat the whites at medium for about 20 seconds, until foamy. Continue to beat while slowly adding the meringue powder. Beat to soft peaks, about 2 minutes. Fold in 1/3 of the almond mixture until incorporated. Repeat with the rest of the almonds, 1/3 at a time, until completely incorporated. Fit a pastry bag with a 1/2 inch tip and fill with the mixture. Pipe the batter onto the parchment lined baking sheet into 1 1/4 inch rounds. Rap the baking sheet on your counter a couple of times. Let sit, uncovered, for 30 to 45 minutes. Bake for 13 to 15 minutes. Cool the shells on the pan. If you are using more than one pan, bake the pans one at a time. Microwave the chocolate in a small microwave safe bowl on medium heat for about a minute, until soft. Stir until smooth and let cool to room temperature. Combine the butter and the melted chocolate in a small mixing bowl. Beat with an electric mixer on low until fluffy. Beat in the peppermint. Sift the powdered sugar and cocoa into the bowl, add the cream, one tablespoon at a time, and beat until smooth. Pipe or spread about 2 teaspoons of butter cream on one shell and top with another shell. You can serve these immediately, but they are at their peak after being refrigerated for 24 hours. They will last about 4 days in the refrigerator.